//Grandma’s Cats (Are Trying to Kill Her!) is a new web series on DreamWorks TV about a boy who must thwart the plans of two cats constantly scheming to kill his grandma. From gooey hairballs on stairs to cat poop in cereal, these two felines come up with any manner of antics to get rid of a cutely oblivious old lady. As animators know, all animation studios must pay homage to the time-honored tradition of evil cats. Thanks to Psyop, we got to animate two mischievous cats as evil as they come. Based in classic cartoon pratfalls and hijinks, Grandma’s Cats includes a wide array of jokes as cute as they are heinous. Our animators loved exhibiting their knack for physical comedy. 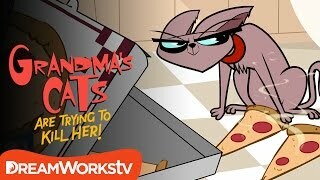 Our own Louie Granda even got to voice the titular Grandma! Check it out to see our expertise in storyboarding, voice acting, Flash animation, and After Effects compositing.